1. SEBI is conducting a survey and creating an inventory of the AI / ML landscape in the Indian financial markets to gain an in-depth understanding of the adoption of such technologies in the markets and to ensure preparedness for any AI / ML policies that may arise in the future. 2. Any set of applications / software / programs / executable / systems (computer systems) – cumulatively called application and systems, to carry out compliance operations / activities, where AI / ML is used for compliance or management purposes, is included in the scope of this circular. In order to make the scope of this circular inclusive of various AI and ML technologies in use, the scope also covers Fin-Tech and Reg-Tech initiatives undertaken by MIIs that involves AI and ML. 3. Technologies that are considered to be categorized as AI and ML technologies in the scope of this circular, are explained in Annexure A. 4. 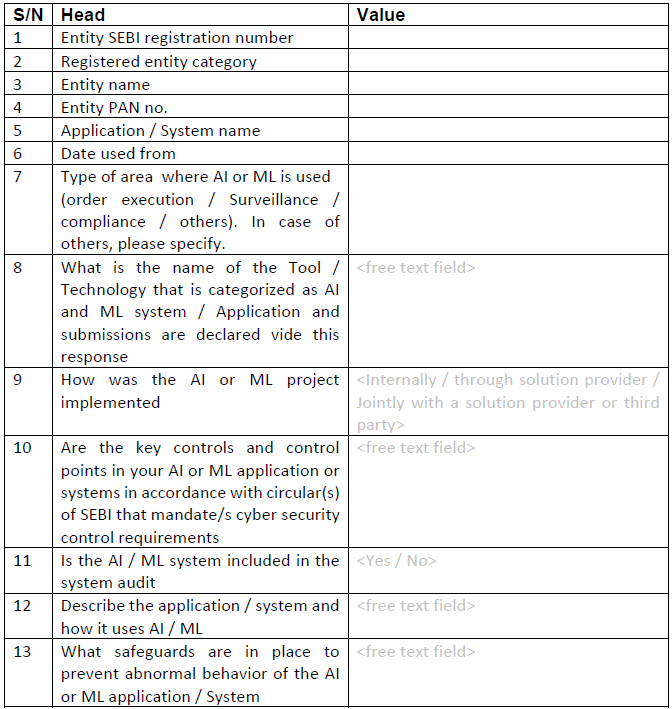 All MIIs shall fill in the AI / ML reporting form (Annexure B) in respect of the AI or ML based applications or systems as defined in Annexure A offered or used by them, and submit the same in soft copy only at AI_MII_SE@sebi.gov.in (for Stock Exchanges) / AI_MII_DEP@sebi.gov.in (for Depositories) / AI_MII_CC@sebi.gov.in (for Clearing Corporations) to SEBI on a quarterly basis within 15 days of the expiry of the quarter, with effect from quarter ending March 31, 2019. 6. This circular is available on SEBI website at “Legal Framework→Circulars”. 1. Natural Language Processing (NLP), sentiment analysis or text mining systems that gather intelligence from unstructured data. – In this case, Voice to text, text to intelligence systems in any natural language will be considered in scope. Eg: robo chat bots, big data intelligence gathering systems. 3. Machine learning through supervised, unsupervised learning or a combination of both. – In this case, any application or systems that carry out knowledge representation to form a knowledge base of domain, by learning and creating its outputs with real world input data and deciding future outputs based upon the knowledge base. Eg: System based on Decision tree, random forest, K mean, Markov decision process, Gradient boosting Algorithms. 5. A system that uses a feedback mechanism to improve its parameters and bases it subsequent execution steps on these parameters. 6. A system that does knowledge representation and maintains a knowledge base.